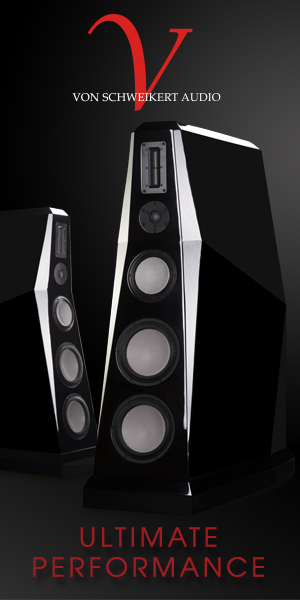 I don't want to bury the lede, so let's start with one basic fact: a pair Burwell & Sons Homage speakers costs $80,000. Let that sink in. Eighty thousand dollars. I wanted to get that out in the open right up front. I'll give you a minute to process. Got it? Good. Because I'm going to spoil the review for you. I liked these speakers. I liked them a lot. Kirsten and I ran into the Burwells, Gordon Sr. and Gordon Jr., at last year's California Audio Show. They were exhibiting an earlier pair of their Homage speakers with a room full of borrowed gear and a closet loaded with a cooler of beer. That model, stuffed as it was with rebuilt Altec components, made me smile. At the time, I thought that it sounded a little boxy, a little shouty, seriously shy on the treble, and a little discombobulated. The bass bin was excellent, but the system clearly needed to exorcise some demons. The crossover seemed to be a particular weakness, keeping up the grand Altec tradition of fantastic drivers tied to complete junk. It was still pretty enough that I almost didn't care. That carved wood horn left me basically speechless. Still... the room was musical enough to make me want to hang out in it. We shoved some beer into the Burwells' cooler, and then we sat and chatted with these two crazy guys for half an hour. Please understand: I'm not using the word "crazy" lightly in this case. These guys are utterly crazy. They're charming, decent folks. They're great company. They seem well-adjusted. And then, as soon as someone talks about speakers, they get a weird kind of light in their eyes. It's a little off-putting, really. 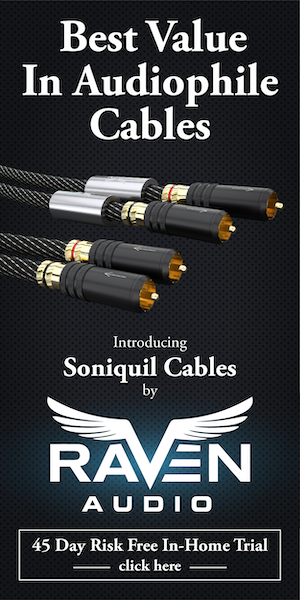 You'd think that kind of zeal would be common enough at audio shows that you wouldn't even notice it. You'd be right, except for one thing. The Burwells aren't audiophiles. The Burwells just love music. They love the experience of music. They're obsessed with it. And they really think that we audiophiles have forgotten the basics. Burwell & Sons, bespoke manufacturer of heirloom quality speakers, was started because they think their old school tricks will change your life. And they're willing to race for pinks. I would have been spooked if Gordon Sr. and Gordon Jr. hadn’t been so damn likable. So we changed the subject, talked about the weather or some nonsense, and then promised to stay in touch. A few months later, Gordon Sr. reached out to say that there was a new version of the Homage ready for review, and, by the way, they had changed everything but the horn. The pair that the Gordons Burwell delivered in early April was Production Set #4 of their Homage line. And, yes, almost everything had changed. The speakers maintained their visual kinship to the old Altec Voice of the Theater horns, but, other than the obvious craftsmanship and the wood horn on top, they had little kinship with the earlier set I’d heard at CAS. This pair, veneered in a deep walnut burl and topped with a walnut horn carved from reclaimed rifle stocks, was filled with JBL drivers instead of Altec. Instead of a two-way speaker, this was a three-way. 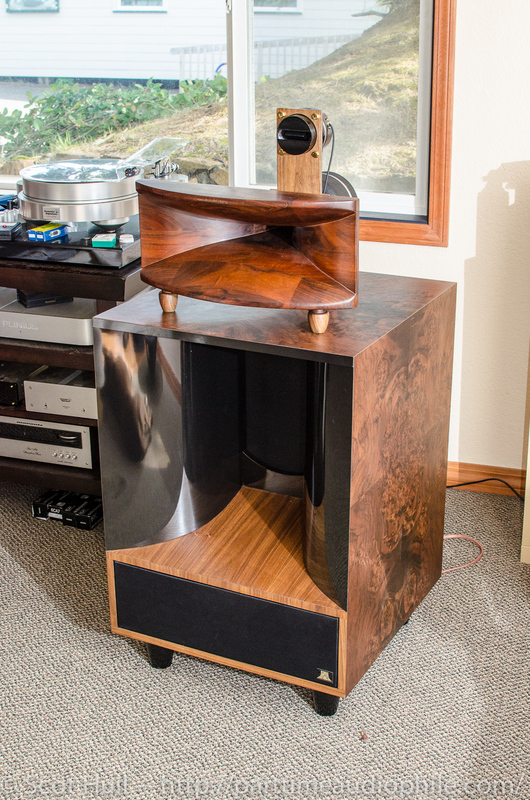 The tweeter, originally a JBL 2405, was fixed to the midhorn assembly by steel panel veneered to match the grain of the midbass horn’s mouth. The monstrous mid-tweet assembly weighed in at something north of “unpleasant” because of what used to be a JBL LE 85 hanging off the back. That got cradled in a lightweight, wooden frame that could be adjusted for height at each of its three feet. This contraption then got set on a bass bin built around what used to be a JBL D130. The bass bin showed new joinery and a different termination of the horn mouth (“It’s just for looks,” says Gordon Jr.). Unlike the 30hz tuning of the previous pair, this set was tuned to 60hz. Inside the bass bin, the new crossover featured pots for adjusting both the midhorn and tweeter levels. 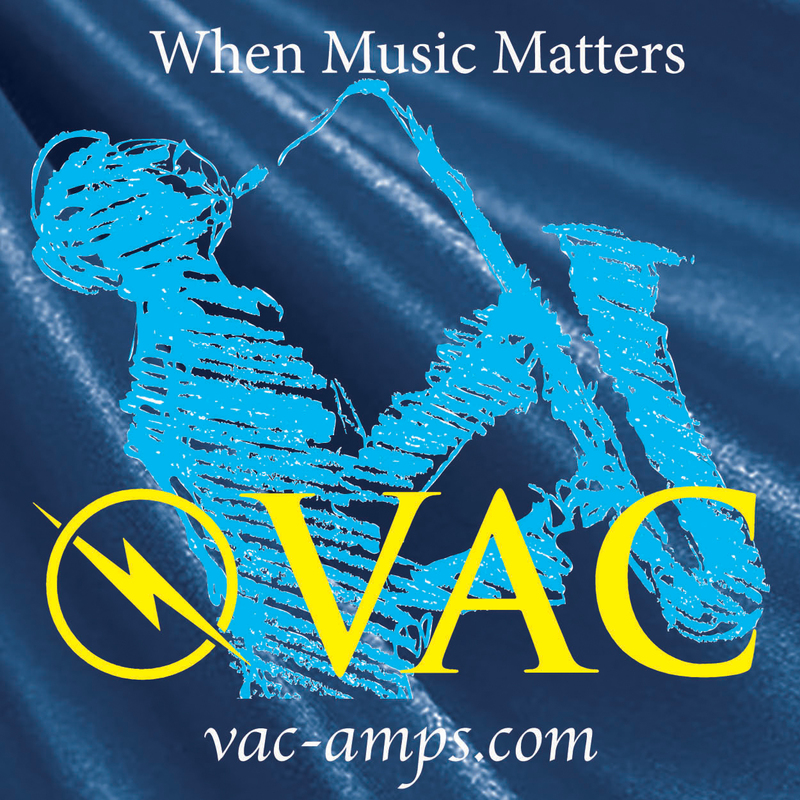 Impedance was a nominal 8 ohms, while sensitivity was set by the bass box at either 93db or 99db depending on how you chose to measure it (we’ll come back to that). Crossover points were north of 1200hz and just about 10kz, making sure that no horn was forced to cover more than a decade. It was a slick piece of work. After sending the Burwells on their way, Kirsten and I stayed up that first night admiring it until the sun started poke out. Well… admiring it and listening to Elvis. 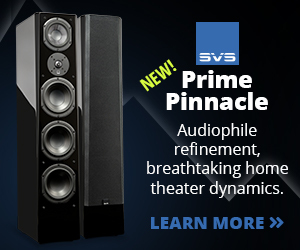 I’m embarrassed to admit that the slickness and build quality of the speakers came as something of a surprise. Despite the obvious skill evidenced by that wooden horn, I was expecting the kind of DIY fit and finish that has put so many erstwhile boutique audio manufacturers out of business. This build quality was so remarkable because of the way Burwell & Sons does business. They’re not interested in modernity. The Homage line is the result, God help us, of the Burwells’ shared artistic vision. You may have noticed that I referred to the drivers by what they used to be. That’s because the Burwells hunt down old drivers and rebuild them. “Most D130s aren’t good enough for this performance. We must have gone through thirty rebuilds per side to get a perfect match,” explained Gordon Jr., “probably worse for the LE 85. I don’t like to think about how much we spent on that.” The wood, too, is reclaimed — even the veneer. Gordon Sr. pretty well haunts California looking for the right stuff. “I’m trying to preserve the past,” he says. The past being what it is, though, getting the speakers to play well in my problematic living room was an exercise in rote iteration. Gordon Sr.’s background in live sound and custom theater builds has led to a pathological amount of flexibility in physical setup. The first step, of course, is to get the bass bins dialed in. The Burwells both prefer them against the back wall. I prefer to use my back wall to house records. This meant that I had to move all the records and their shelves out just long enough to find out that I preferred the rear of the bass bins about 24″ from the back wall, and about 40″ from each sidewall. The next step is a slow rotation of the bass bin until the horn’s coverage sweeps the intended listening area, resulting in a moderate level of toe-in that covered three seats on my couch and my entire dining table. The next step after that, of course, was putting all the shelves and records back. You’d think that would have been the hard part, but aligning the horn assembly took even more doing. As mentioned, the horn cradle is both free to sit on the bass bin and adjustable for angle. I didn’t mention that it’s completely unmarked. This means that setup can take hours. This also means that your very careful listening and measurements can be shifted completely by seventy-odd pounds of exuberant pit bull slamming into the side of one speaker — which turned out to be my dog’s new favorite hobby. If the Burwells change one thing on their next pair, I’d hope they come up with a good way to lock down that whole #!#!$%&! assembly. My wife, my dog, and my neighbors are probably still traumatized from the volume of my swearing. Once your speakers are pointed in the right direction, you’ll start bringing the crossover into balance. You can get pretty close by ear unless you’ve blown out your hearing swearing at the dog. A microphone and an RTA come in pretty handy at that point. When you’re done, though, you’re rewarded by a flat in-room response from about 250hz to just over 18khz, with significant treble energy above 20khz. You’re also rewarded by a horn speaker whose drivers integrate seamlessly at a listening distance something less than six feet away. If you’re used to an Altec A7, this is very much like finding out that Santa Claus, the Easter Bunny, and Bigfoot are all real. An afternoon of playing with amps followed. We tried a Miniwatt N3, which turned out to be fairly useless here. A DIY 300b SET didn’t fair any better, offering the kind of tonal purity and sound stage that only a man who never cranks AC/DC could love. 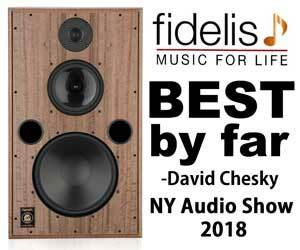 A pair of Hagerman Cymbals — an unjustly discontinued and forgotten amplifier that loves my old Altec 604-8g — were up next and faired better, giving a taste of the transient snap that the Homage speakers could deliver. The amps that spent the most time plugged in (read: weeks) were Manley Snappers. The sad fact is that the big JBL cones like to have more than a little bit of grip, and they absolutely thrive on power. 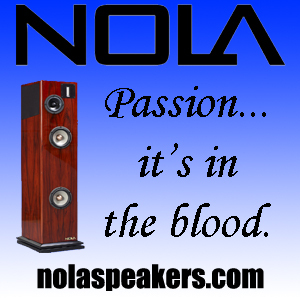 When it comes to juice, this is not a “less is more” kind of a speaker. With all of the setup done, and all the dancing partners assigned, it was finally time to listen …. Start by imagining the biggest, baddest, LS3/5a that you can. That’s the kind of spooky disappearing act these monsters pulled in my room. The soundstage extended well past my front window, well past the side walls, and well over my shoulder. With one exception that I’ll note later, the speakers themselves were not a noticeable presence. This easily bettered my Tannoy Glenairs, entirely removing my room in a way I’ve never quite managed to achieve with them. Razor sharp images weren’t so much the order of the day as were realistic images. Heads were head-sized, while instruments were clearly over there-ish. Tori Amos’s “Father Lucifer,” for instance, didn’t involve even one giant pumpkin head floating in space (which would be bad), but did clearly suggest that she was stomping on some pedals right there. While not offering the specificity or diagnostic imaging of, say, a Magico S1, the Homage created a more than realistic enough illusion to count as hallucinatory. This was never more clear than on Zoë Keating’s remarkable “Optimist” from her album Into the Trees. It took on a new expressiveness, revealing layering subtleties that I felt deaf for missing the first time around. If the Homage’s imaging was a weakness — and I don’t think it was — the massive alnico magnets’ way with tone and micro-detail more than made up for it. Listening to Gidon Kremer’s “Fuga Allegro” from Bach’s G Minor Sonata seemed less an exercise in style than some kind of purifying flensing. Similarly, Barbara Hendricks’ haunting performance of “Strange Fruit” with the Magnus Lindgren Quartet showcased the smokiness and passion that has so characterized her voice as it ages. Most impressive to me was playing the Mekons’ 2007 album Natural in its entirety… over and over again. It’s a strange recording, seemingly done by mailing tapes back and forth, but every listen on the Homage speakers brought a new subtlety to the front. I had to reconsider my previous belief that it was one of their lesser albums. All that, and I still haven’t mentioned dynamics. The Homage speakers are horn loaded down to 250hz, 99db efficient, and I was powering them with 100 watts of crunchy tube power. Let’s start with HOLY CRAP and take it from there. Max Roach’s “Self Portrait” from his 1991 album To The Max! was terrifyingly like watching him perform it from the fifth row of the Count Basie Theater. Drums were startlingly lifelike. Some drummer friends (because drummers need friends, too) made it clear that these were the first speakers they’d heard that made drums sound real. The dynamic range on tap served Big Band music well, with Count Basie seeing regular play. In fact, everything with a piano hit the playlist. Duke Ellington and Ray Brown’s This One’s for Blanton! was a fierce reminder that the piano is, in fact, a percussion instrument. Also on deck was René Jacobs’ take on the St. Matthew Passion, where both choirs’ voices remained separate entities. More impressive was my terrible, late 80’s vintage CD of Brahms’ German Requiem. This 1979 recording of Georg Solti and the Chicago Symphony (with Kiri Te Kanawa) will stress most stereos (and metalheads) with its fearsome version of “Denn wir haben hie keine bleibende Statt.” The Homage speakers maintained their composure throughout. That composure was in part due to a very, very large dynamic envelope. 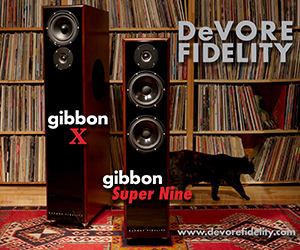 It’s difficult to put enough power into too many hi-fi speakers. Between strange folklore about proper amp sizing and the thermal limitations of many hi-fi drivers, some compression tends to sneak in. The Chicago Symphony Chorus barreling full tilt down the pipe tends to trigger that kind of compression. Not here, where the chorus was clearly made of individuals working together instead of just a barrage. Which brings us to Rock, real music, for which I’d prefer a good PA speaker to a polite audiophile setup. The Homage is fine. Oh, yes; it is just fine. Yngwie Malmsteen? You will believe that you are a viking. The first side of ZZ Top’s Fandango! will blow you out. Put your earplugs in, crank the knob to the right, and throw on AC/DC so Angus can rip “Thunderstruck” out at you, you personally, as you stand in the back yard. 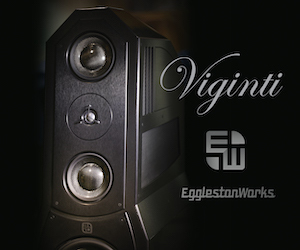 Sure, the Homage speakers are subtle and delicate and revealing, and, sure, they’re magnificently complete at low volumes, and, sure, those are the excuses you can give yourself to justify them. The real truth is that the Homage speakers are first class party beasts. They are built to rock out. Whether it was Shuggie Otis, The Coup, or the Clash, they did it. There was nothing intellectual about it. It was completely unrestrained. Speaking of the sub-intellectual endeavors, the Homage’s dynamics also turned out to be very well suited to watching movies. Kirsten decided to have a Disney night, and I was treated to a surprisingly immersive evening watching Frozen and Tangled. I hate myself for saying this, but I enjoyed them both. I blame the speakers for that. More importantly, though, they did complete justice to Ronin, the finest movie and the two finest car chases ever filmed. No, the Homages are not perfect. Some of those imperfections are design compromises, but some of them are bugs that need to get worked out. Let’s deal with the two design aspects first. You probably already noted that the cabinets are ported at 60hz. Depending on your setup, you’ll get more bass in the room (my room loaded solidly to 45hz). You’ll probably want subwoofers, but subwoofers that can keep up with these speakers will be neither small nor cheap. You also noticed the horn on the 15″ driver. That’s one of the great strengths of the speaker, but it’s also a royal pain for perfectionists. Efficiency drops 6db at the horn cutoff frequency. Remember earlier when I said that efficiency was either 93db or 99 db depending on how you measured? I was talking about this. The telephone band, where we’re most sensitive, is covered by the horns. Immediately below that, though, is a quick step into direct radiator territory, and that 6db difference is immediately noticeable. That difference is also probably intolerable to most modern listeners. 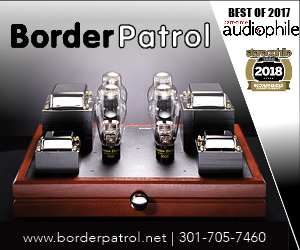 The traditional solution was an equalizer ahead of the power amp, and I’d recommend that here. I listened without an equalizer, however, and I found the speakers more than rewarding. The bugs, on the other hand, leave some room for improvement. I’ve talked about the horn cradle. More to the point: I’ve sworn about the horn cradle. It’s a thing of beauty, but it’s a pain in the neck. If you’re a customer, don’t be a hands-on obsessive like me. Insist that someone else set these speakers up for you. If you have a large, bouncy dog, keep it out of the room unless you want to repeat the process a couple of times. Also problematic is Burwell & Sons’s commitment to the old ways. After designing this wonderful bass bin, they decided to allow a panel resonance to develop on the sides. This gives a lovely warmth to the low-end of Nat King Cole’s voice, and it offsets some of the efficiency loss from the front horn’s stepped response, but it also means that there’s a panel resonance. This occasionally makes the speakers more localizable than I would like, and it can smear some more complex listening material. It’s minor, the Burwells did it on purpose, it’s not terribly intrusive, and it’s apparently optional, but it’s there. Besides, I had to have something to complain about. Well… something besides the price, that is. At $80,000, there’s a fairly serious question of value that needs to be addressed. I’m not sure that I’m capable of addressing it. 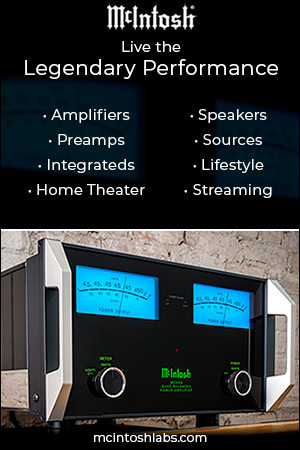 The Homage has a combination of audiophile strengths that I haven’t seen in any affordable, turnkey speakers. 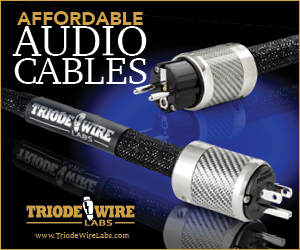 They also have weaknesses (that stepped low-frequency response) that are poorly served by off the shelf analog solutions. 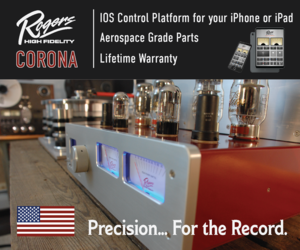 The audiophile world is filled with specialized, modern tools, and the Homage is something of an atavism in comparison. 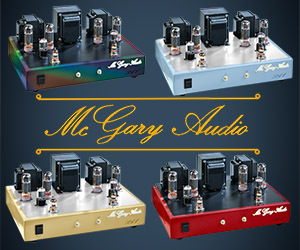 There is also the simple fact that the Homage is not really an audiophile product as such. 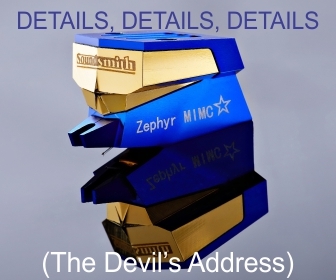 It’s an excellent — surprisingly excellent — speaker, but the parts supply, the choice of materials, the excessive labor, and the individual development costs for each model necessarily make this an extreme rarity. The adaptability, versatility, and simple attractiveness make it a real luxury. It’s a turnkey solution for somebody with deep pockets and very particular taste. What I can say is that I’ve lived with very few speakers that fit so well into so many roles. Whether it was sitting in the sweet spot to get tearfully lost for a few hours, providing background music while cooking, giving great theater sound, or entertaining guests, the Homage was unobtrusively magnificent. It was equally adept at intimate, nearfield listening as it was entertaining large groups with its giant sweet spot and practically unlimited dynamics. 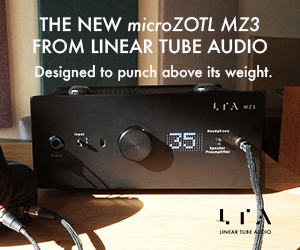 Non-audiophiles responded to it in a way I’d never seen — they loved it at least as much as audiophiles. Its friendly size and gorgeous craftsmanship made it a visual delight even when music wasn’t playing. I can’t imagine anyone being sad about having it around. The Burwell & Sons Homage is, in short, a statement class lifestyle product. It’s a speaker for the kind of person who buys Stickley, not Design Within Reach. It’s a speaker for the kind of person that would rather have a perfectly restored Shelby Cobra than any Ferrari with a paddle shifter. It is, at $80,000, a speaker for the kind of person with enough money to care about those distinctions. If I’d had the eighty grand, I would never have let the Burwells take their pair back. I still miss them. Besides relaxing with music, his hobbies include soldering, chain smoking, driving too fast, and playing with his dog. He dislikes biographic blurbs and detests writing about himself in the third person. Mal also contributes to Digital Audio Review. Yes, it’s expensive. Not in doubt, or even in question, and IIRC, it was probably the first thing mentioned in the article. Still, it’s interesting. I’m glad you mentioned the price again. If that price had been at all approachable, or if Burwell & Sons could mass produce these, I would have given them an unqualified recommendation. 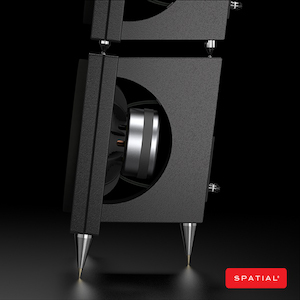 There is certainly competition for these speakers. 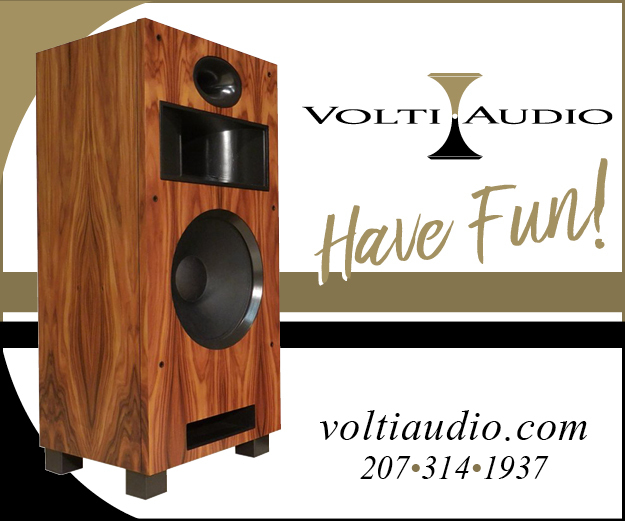 Volti Audio comes to mind as a relative bargain, but their speakers lack the wide sweet spot, the alnico tone, and the easy treble extension that the Burwells deliver. Similarly, La Grande Castine will offer you similar hornloading — without alnico — for around $100,000. Neither will appeal to people seeking that platonic ur-Lansing sound or the particular aesthetic the Burwells provide. This isn’t the first time you’ve been aghast at the pricing for the somewhat more exotic products from this industry. I have to say that I have some sympathy for that position. Unfortunately, my sympathy ends the moment someone refuses to go into the garage and DIY his own, superior example of the breed. Those are certainly beautiful speaker enclosures and the hand carved horns are to die for.